We open this month's issue with a contribution from Ian ('our man at Brooklands') and his colleague Martin Gegg, about problems with the Museum's Sopwith, and ABC's early presence at Brooklands. I stifled my disappointment by talking to one of the Volunteers about Bradshaw and the History of the Company behind the bike. Martin Gegg had covered ABC and Bradshaw during his WW1 motor- cycle research. Martin explained that he had only just skimmed the surface but suggested that Bradshaw was a brilliant designer, who seemed more interested in designing than in the managing businesses. Granville Bradshaw joined Walter Adams and Ronald Charteris to form the All British Company (ABC) in 1911. The name was apparently a reflection of their patriotism rather than perhaps the more obvious initials of their names. Martin said that it was Bradshaw who designed the ABC logo of the aero engine company which was based at Brooklands Flying Village in what was known as Birdcage Walk. Bradshaw, a Triumph rider, soon turned his attentions to motorcycles, designing the first Bradshaw machine in 1912. Bradshaw's association with Brooklands pioneers including Freddie Barnes of local firm Zenith led to more motorcycle development. 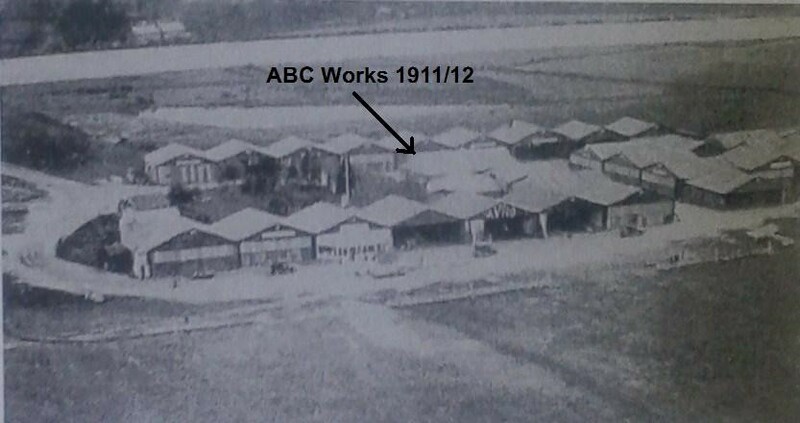 An enforced move to Hersham after the Royal Flying Corps took over their Brooklands base coincided with Bradshaw referring to the firm as ABC motors in adverts of the time. By the end of 1914 the company was producing chain driven machines with sprung frames and optional kick-starts! WW1 activity was focused on the manufacture of pump and generator engines. Martin discovered that ABC did produce a prototype machine during WW1 based on a small auxiliary (250 cc?) generator engine bolted into a lightweight frame. Martin was not sure if this was a serious project or just a test bed for the engine, but suggested the answers to this question and many more may be in “Granville Bradshaw: A Flawed Genius? by Barry M Jones”. 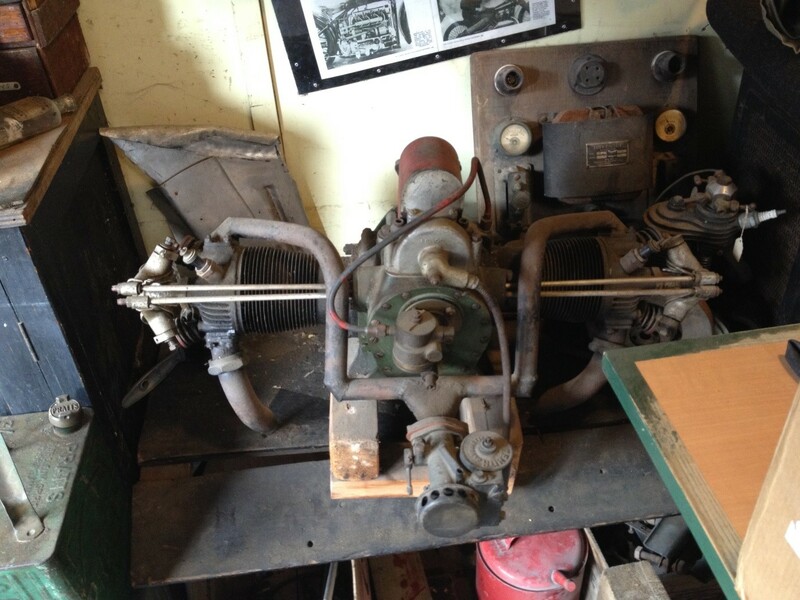 Bradshaw's post war association with Tommy Sopwith resulted in the 1921 horizontal twin we have been working on. Bradshaw was subsequently also associated with Harry Hawker producing the short-lived Hawker Motorcycles. For those interested in all things Bradshaw, as well the ’21 398 cc twin , the museum has a Scootamota, Zenith powered by an oil-cooled horizontally opposed Bradshaw engine and a ABC light car engine (more of which later). Latest news - A call with Keith Sams, gave us some further leads on what might be at fault and following his suggestion, we found significant cross plane movement on the main gear box shaft where it meets the crown wheel. It means the gearbox needs come out and be stripped. On the plus side, now we have two years to prepare the ABC for the next Montlhéry Revival. This is the Museum's Sopwith, on display. Note the Taylor & Young fully-enclosed rockers, one of the several after-market alternatives to the originals. This was surely the neatest of the options although the late, great Bob Thomas was rather scathing about it, perhaps because it relied on only a two-bolt fixing to each cylinder head. (The four-bolt mountings of the Inglis and Jarvis options were sounder). 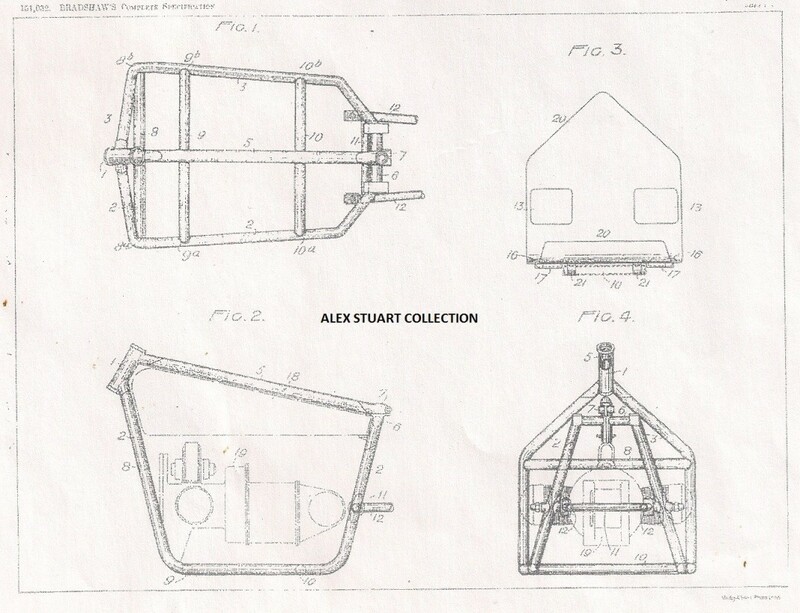 The next pictures complete Alex's rare collection of ABC Patent Drawings. Patent No. 151032 refers to a "Symmetrically splayed tubular motorcycle cradle frame for a flat-twin engine". Fig. 5 seems to highlight a shallow toolbox recessed into the undershield: or is it only a goo-trap for the power unit? 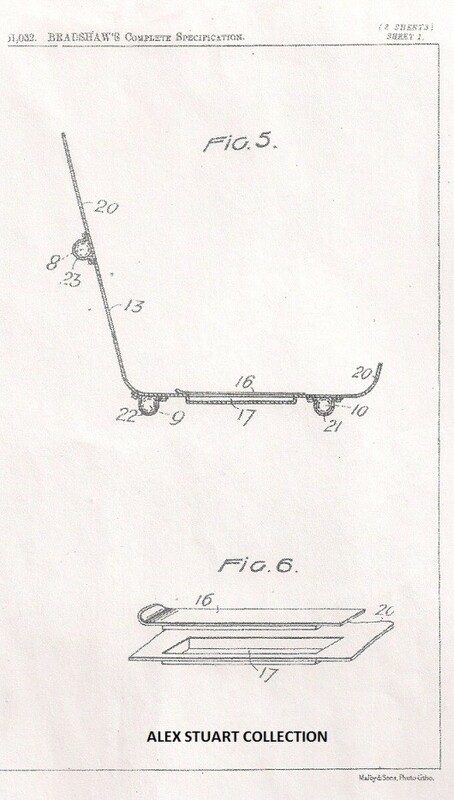 Referring back to the drawings of Patent No. 139570 in Newsletter No. 1018, John Emanuel wonders what there was to patent about G. Bradshaw's front fork, apart from the clamping of the suspension leaves at their forward ends. Perhaps this fixing was simply a ploy to avoid infringing a more sensible design: but if so, why bother to patent it? John looked at obtaining a full copy of the patent, but was put off by a £40 price tag. Does anyone know of a more economic route to the British Patent Office? Andrew is now going it alone, getting a new pair of bevel gears made up. It seems that the splines on the (integral) mainshaft present an extra problem, because there are five of them, not the usual six. Anyway, we hope to hear from Andrew in due course of the satisfactory supply of his replacements. 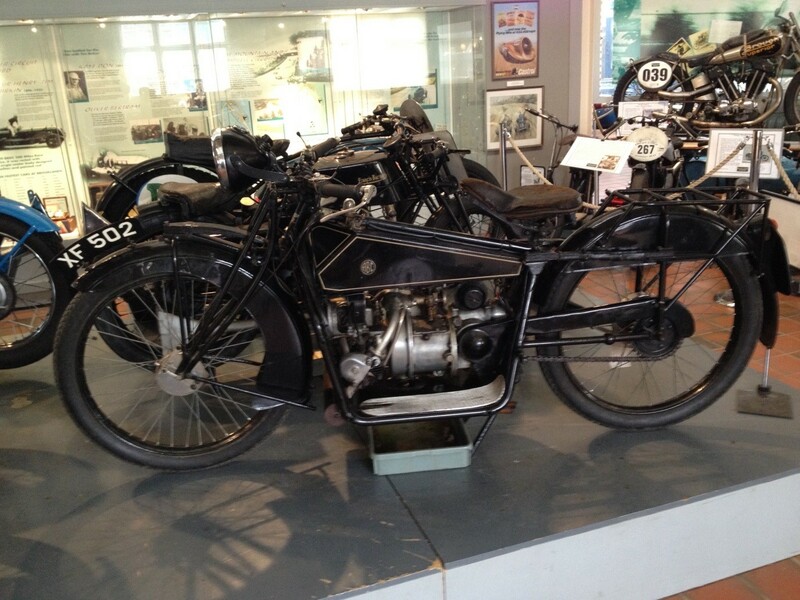 This picture also comes from the Brooklands Museum, courtesy of Ian. The engine bears a label that suggests that it is from a 'light car', and this may be so, but what was it built for? Kim thinks that it is a demoted Scorpion aircraft engine, although David remarks that the car engine was also known as a Scorpion. But either way, I would want to tidy up the plumbing a bit, before putting it to further use! Giovanni's clear and explicit instructions for access to our new Website are being sent in parallel to you. The difference between a Newsletter and the Website will be comparable to going out to buy a paper, rather than having it delivered. Because of the more public nature of the website, however, it will not include the Asssociation's Membership List, which will remain confidential to the members, with the terms of membership remaining unchanged. The Association will continue to welcome new members, of course: the more, the better. The Membership List will be updated to reflect progress. Circulation of this Newsletter is 23. There have been no addditions to the Membership this month.